An auction of items from the home of the late GeneRoddenberry, creator of "Star Trek," will be held to benefit charitythis summer. Vintage Trek scripts and William Shatner's motorcycle are just afew of the items up for grabs. Memorabilia from last summer's re-launch of the "Star Trek"film series and a few odds and ends from William Shatner, the original Capt. JamesT. Kirk of the Starship Enterprise, are expected to sell at warpspeed if all goes as planned for organizer Julien's Auctions.?? Among the Trek-related items on the auction block fromRoddenberry's home are a script from "Star Trek: The Next Generation"with handwritten notes by Roddenberry himself, a model Starship Enterprise fromhis office, and costumes worn by Roddenberry's wife, Majel Barrett, when sheportrayed Counselor Deanna Troi's garrulous mother Lwaxana Troi in several episodesacross two different television series in the Trek universe. The auction of the Roddenberry estate items will take placeat the Planet Hollywood Resort & Casino in Las Vegas on Sunday, June 27,and all of the proceeds will go to charity. Other personal effects, home furnishings and decorationsfrom Roddenberry's Bel Air, Calif. home will go sale as well, including hisdecidedly dated early IBM computer. Some 25 props, costumes and set pieces from J.J. Abrams'blockbuster "Star Trek" flick last summer will also be beamedto new owners in June. On sale will be the costume worn by LeonardNimoy — who recently retired — as Spock from the future when he meets ayoung James T. Kirk (played by actor Chris Pine) on an ice planet, as well asthe Starfleet cadet uniforms and insignia badges sported by Pine and Zoe Saldanaas Uhura. Prop weaponry including phasers and gear fromthe warshipped-out Romulan mining vessel helmed by the movie's villain Nero(played by Eric Bana) are also slated to change hands. 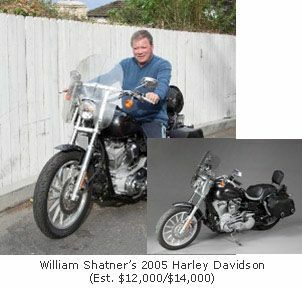 William Shatner will also offer up some items from his personallife and career in show business. These include a custom Harley Davidsonmotorcycle and a pinball machine inspired by "Rescue 911," the Shatner-hosteddocudrama that aired from 1989 until 1996. Shatner will also make a June 24 appearance to sign autographsand pose for photos to raise funds for his own charity, the Hollywood CharityHorse Show, auction officials said.